This afternoon, I was doing some grocery shopping. As I leaned over to get peanut butter, my grocery cart jammed into my abdomen. This led to me crashing back against the metal shelves which caused all the cans to hit the floor and my arms to get scraped on my way to thee floor. I hit the floor with my head and my hip. My foot was twisted as well. An elderly lady was taking the corner of the aisle at high speed on her motorized metal grocery cart and hit me dead on. This caused quite the commotion. After I realized that I was OK, several men helped me off the floor. The elderly woman was crying and I was afraid for her since she did not appear well. So I gave her a hug and told her I was perfectly fine. Well, I lied, a little. I just wanted to get home. I am quite sore and my head is hurting. I wrote about 60 % of the post and found I couldn’t concentrate due to a headache. only when you are well will we visualize this and maybe get a giggle at the slapstick of it. until then, lifting you up! Good Lord! Praying for you Dee! Oh my! Please take care of yourself, Dee. Praying for you! Bless you! As they say, “You couldn’t make this stuff up!” Praying that your recovery is swift and that you can rest tonight. Glad to hear you’re safe and sound! Hope you’re feeling better soon. You’re a nurse and hubbies a doc, soooooo . . . a concussion shouldn’t be hard to diagnose if necessary. Hope you are feeling better soon, Dee! I will keep you in my prayers. You need a large bubble to live in…. Ouch! So glad you weren’t seriously injured! …….. but, still ….. can’t help but giggle a little. Fact is stranger than fiction, again. I hope I’m wrong, but I think you may be pretty stiff and sore tomorrow. Just take it easy. We can wait. Praying for you, Dee. Please take good care of yourself. Praying too for the elderly woman who hit you. “After I realized that I was OK, several men helped me off the floor. The elderly woman was crying and I was afraid for her since she did not appear well. So I gave her a hug and told her I was perfectly fine. oh, dee, so sorry! these things are so painful. i’m glad you’re ok — but i’m sure very sore. thank you for being so faithful with your blog and all us readers. you and deb are truly appreciated very much. your story brings to mind that everybody lies, now and then (even neo-calvinists… even Robert), in a variety of complex moments & for a variety of selfless reasons. …and GO MEN! how great that their instant & automatic reaction was to simply help you. they do me proud. indeed, being human is something to be proud of. that’s my deep conviction, that makes me very happy. Take care, Dee! I’m in Nagasaki today and visited the museum of 26 Martyrs, men and teens who were crucified on a hill near my hotel in 1597. I’m on my way to Unzen, where there’s a volcanic national park and, our guide told us, Christians were tortured at the hot springs and various other volcanic features in the region. Japan is an amazing place! Take care, Dee! Praying for you. Oh no! What a terrible experience. I hope you recover soon, Dee. Praying for you. Hope all is well and there is no concussion. this does sound like a prelude to a corny Christmas song. Really sorry to hear your news. Scotland has arranged three days of continuous rain in sympathy. This won’t actually help. But we all hope you’re feeling better soon. Oh, gosh, you just never know what a day is going to bring forth! Praying there is no lasting damage and you recover quickly, Dee. Oh no! Hope it all heals soon! Perhaps see your primary care physician for a checkup and perhaps tests, Dee, especially if you are on a blood thinner. We don’t want to lose you to a brain bleed. Oh that’s really awful. Frightening when it happens. I’m sorry to hear it. Hope you can rest peacefully. This is terrible. I wish I were there to help. Please make yourself your priority until you’re well. Oh, my. Hope all goes well. Maybe she can be filed under drunk driving? Geezer Zombies should not be behind the wheel. I am so sorry! May you find peace and healing in rest! And don’t go crazy watching all the personal injury lawyers commercials on TV! The real issue here is simple: smooth or chunky peanut butter? Seriously, appreciate all that you do. Praying for you to feel better. Dee, I am sorry for your accident, and hopeful for a speedy recovery. Praying for you & yours, and for the elderly lady. Thank you for your kind comments. I am doing much better today except for a very sore shoulder and arm. I have to admit, the entire situation was rather amusing to think about later on. It was chunky peanut butter. As I leaned over to get peanut butter, my grocery cart jammed into my abdomen. This led to me crashing back against the metal shelves which caused all the cans to hit the floor and my arms to get scraped on my way to thee floor. I hit the floor with my head and my hip. My foot was twisted as well. This is commonly called “The Wile E Coyote Effect”. God knows when a post should be posted. You take care of yourself. dee: It was chunky peanut butter. Before you know it, they are going to need to put traffic signals and grocery stores! Here’s hoping you recuperate quickly! Here’s hoping you recover quickly from this incident. In all seriousness–I pray that all parties involved are O.K.! That whole things sounds like some cheesy horror spoof where inanimate objects under some evil influence start attacking the main character. Glad you’re doing better. In other news, Paige Patterson’s come back is almost complete. He has taken to Twitter for the first time since his demise at SWBTS, announcing a new web site and promoting his role at Southeastern Evangelical Seminary’s “Ethics” conference. Southeastern Evangelical Seminary seems to have been on a downward spiral. They recently sold their campus because of a cash crunch. I see Patterson’s presense as a “Hail Mary” to raise visibility and $$$. Interesting. Based on Twitter comments, it appears a lot of people are incorrectly assuming SES is a Southern Baptist Entity. Root 66: I’m sure Piper will be tweeting real soon that a MAN should have been driving that motorized scooter instead of a woman. That elderly woman ran into you because she was rebellious and not under the proper ‘authority’ of a man, so she is not only damaging the ‘gospel’ but your chunky peanut butter as well! Actually, he will tweet that it was preordained before the foundation of the world as a result of God’s mysterious decree! So sorry to hear about this, Dee! I’m glad to hear that you’re not feeling too badly, and I hope the pain will ease soon. Muslin, fka Dee Holmes: Japan is an amazing place! I hope you’re enjoying your stay! I’ve never been to Nagasaki, although I’d love to see lots of places in Kyushu. Don’t know what your itinerary is, but if it takes you near Niigata, I’d love to meet you in person. The Deebs can let you know what my e-mail address is, if you want to get in touch off the message board. Have a great visit! Yes, but I haven’t figured out who the “and Co.” are. Get well soon from Ireland. Look after yourself, Dee! Wishing you a speedy recovery. Hang in there, Dee. Glad you are a nurse married to a doctor at times like these. Life is unnecessarily difficult it seems some days. Lots of us cheering and praying for you. You are not even in my top 100 of people that I think might benefit by getting clobbered by cans as they fall on the floor and being whacked by a lady in the motorized cart. So sorry to hear of your travails in the grocery aisle, Dee. On a separate note, https://www.charlotteobserver.com/living/religion/article218559230.html Good for the two sisters who never gave up and good for the guy who FINALLY took down the picture of the pastor/molester. That whole things sounds like some cheesy horror spoof where inanimate objects under some evil influence start attacking the main character.Glad you’re doing better. Vinnie: Actually, he will tweet that it was preordained before the foundation of the world as a result of God’s mysterious decree! And God was preordained to decree it! Wartburgers must understand that this did not happen because of purposeless predestination nor because the elderly driver was not under appropriate male authority. In fact, God was lashing out in anger at homosexuality. Normally, of course, these holy tantra result in multiple deaths, to teach us things. We must be grateful that this one did not. Also some skyscrapers in Dubai are going to fall over for the same reason. Please note that I’m saying this from a secret location because of the dangers for Christians here in Scotland. **** – am I a Hebrews 11 Hero Of The Faith or what. The free Horror Channel over here is showing Night of the Living Deb tonight. Wikipedia describes this as a “romantic zombie comedy”. I’m sure there’s a lesson for us all there. NJ: That whole things sounds like some cheesy horror spoof where inanimate objects under some evil influence start attacking the main character. No, I’m quite certain it was planned and executed by some of the pedos and their friends whom the Deebs have been exposing! I thought Shawn of the Dead was the Zombie Rom Com. Once again– there is NO topic which cannot be turned around to be all about— MOI! Need to get my tweeter in gear for this one. Pastor John wasn’t giving his full attention to glorifying God by enjoying Him forever. SOOOO… to get Pastor John’s attention, God ordained that this afternoon I was doing some grocery shopping… etc usw and so on. Oh Dee! I’m so glad you’re okay, & I feel bad for laughing. I hope the driver is okay too. If it makes you feel any better I punched myself in the face the other day, when I was in bed & whacked an uncomfortable pillow to make it change shape, & my fist kept travelling & my thumbnail snagged on my eyelid meaning I woke up to crescent shaped cut under my eyebrow & had to explain that to several youth clubs full of young people. My gracefulness knows no beginning. Oh, my goodness! Rest and recover. I’m sure the speeding driver feels terrible. We’ll look for an update on your condition when you’re up to posting, and pray for you in the meantime. While a painful episode in real life, it has possibilities for an amusing movie scene. Nightmare in the Grocery Store. Attack of the Motorized Grocery Cart. Need for Speed, Grocery Edition. The Little Grocery Cart Around the Corner. Yikes!! I hope you get a checkup just to be cautious and that you feel better soon! Just wondering if Turk’s mother lives in NC? Seriously though, shopping is getting to be a risky business with all those maniacs in electric carts buzzing around. A NASCAR driver at Bristol has better odds of escaping unscathed! Stay safe out there, we can’t afford to lose you! Todd Wilhelm: Just wondering if Turk’s mother lives in NC? OTOH, as far as I’m aware, we only have the interweb’s word for it that “Turk” isn’t an elderly woman. Nick Bulbeck: OTOH, as far as I’m aware, we only have the interweb’s word for it that “Turk” isn’t an elderly woman. Or a chicken pecking the keyboard. 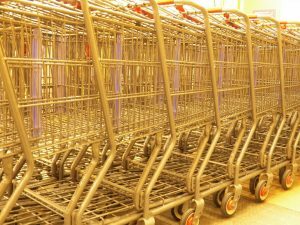 Todd Wilhelm: Seriously though, shopping is getting to be a risky business with all those maniacs in electric carts buzzing around. Out here we call them “Obesity Scooters”. Just noticed 66 comments… too similar to 666 comments (see earlier post). Here let me fix that– there that’s better. Root 66: Perhaps it’s a sign that the lady driving the scooter is the MOTHER of the Beast!I’m glad you fixed it! That’s it! And God’s been sending himmicaines her way to try and get her attention!